was done, he was so conscience-struck that "he wished he had been outside at his liberty, even though it had been with the loss of one of his arms." When Odo de Dompierre, with great reluctance, at length spat on the cross, he said that he did it with such bitterness of heart that he would rather have had his two thighs broken. Michelet, in the account of the proceedings against the templars in his "History of France," offers an ingenious explanation of these ceremonies of initiation which gives them a typical meaning. He imagines that they were borrowed from the figurative mysteries and rites of the early Church, and supposes that, in this spirit, the candidate for admission into the order was first presented as a sinner and renegade, in which character, after the example of Peter, he was made to deny Christ. This denial, he suggests, was a sort of pantomime in which the novice expressed his reprobate state by spitting on the cross; after which he was stripped of his profane clothing, received, through the kiss of the order, into a higher state of faith, and clothed with the garb of its holiness. If this were the case, the true meaning of the performance must have been very soon forgotten. presbyter, when called upon to perform this act, refused, and was allowed to kiss his receiver on the navel only. A presbyter named Ado de Dompierre was excused for the same reason, 86 as well as many others. Another templar, named Pierre de Lanhiac, said that, at his reception into the order, his receptor told him that he must kiss him in ano, because that was one of the points of the order, but that, at the earnest supplication of his uncle, who was present, and must therefore have been a knight of the order, he obtained a remission of this kiss. templars themselves. We are not inclined to reject altogether the theory of the baron von Hammer-Pürgstall, that the templars had adopted some of the mysterious tenets of the eastern Gnostics. class of popular superstitions, perhaps, than that of the templars. as it comes from so distinguished an orientalist and scholar as the late baron Joseph von Hammer-Pürgstall. It arose partly from the comparison of a number of objects of art, ornamented with figures, and belonging apparently to the thirteenth century. These objects consist chiefly of small images, or statuettes, coffers, and cups. 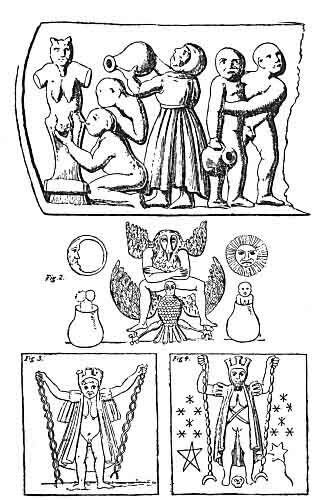 Von Hammer has described, and given engravings of, twenty-four such images, which it must be acknowledged answer very well to the descriptions of their "idol" given by the templars in their examinations, except only that the templars usually speak of them as of the size of life, and as being merely heads. Most of them have beards, and tolerably fierce countenances. Among those given by Von Hammer are seven which present only a head, and two with two faces, backwards and forwards, as described in some of the depositions. These two appear to be intended for female heads. Altogether Von Hammer has described fifteen cups and goblets, but a much smaller number of coffers. Both cups and coffers are ornamented with extremely curious figures, representing a continuous scene, apparently religious ceremonies of some kind or other, but certainly of an obscene character, all the persons engaged in which are represented naked. It is not a part of our subject to enter into a detailed examination of these mysteries. is identical with that on the lid of the coffer found in Burgundy, but it is distinctly represented as androgynous. We have exactly the same figure on another coffer, in the Vienna museum, 99 with some of the same symbols, the star, pentacle, and human skull. Perhaps, in this last, the beard is intended to show that the figure must be taken as androgynous. "Exaltetur Mete germinans, stirps nostra ego et septem fuere, tu renegans reditus ῶρωκτὸς fis." This still is, it must be confessed, rather mysterious, and, in fact, most of these copies of the formula of faith are more or less defective, but, from a comparison of them, the general form and meaning of the whole is made perfectly clear. This may be translated, "Let Mete be exalted, who causes things to bud and blossom! 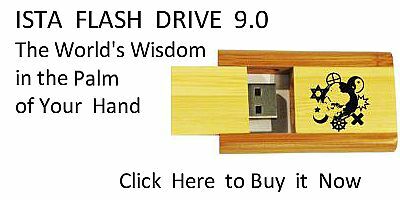 he is our root; it (the root) is one and seven; abjure (the faith), and abandon thyself to all pleasures." 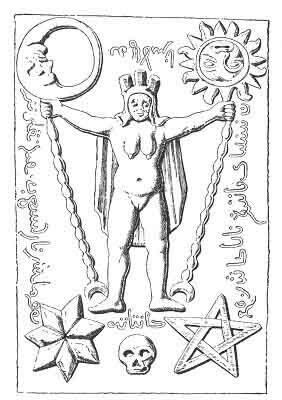 The number seven is said to refer to the seven archons of the Gnostic creed. applied to Mete, or Baphomet, is in accord with the statement in the formal list of articles of accusation against the templars, that they worshipped their idol because "it made the trees to flourish and the earth to germinate." The abjuration of the formula on the monuments seems to be identical with the denial in the initiation of novices to the order of the Temple; and it may be added, that the closing words of the formula involve in the original an idea more obscene than is expressed in the translation, an allusion to the unnatural vice in which the templars are stated to have received permission to indulge. There is another curious statement in the examinations which seems to point directly to our images and coffers--one of the English witnesses under examination, named John de Donington, who had left the order and become a friar at Salisbury, said that an old templar had assured him that "some templars carried such idols in their coffers." They seem to have been treasured up for the same reason as the mandrake, for one article in the articles against the templars is that they worshipped their idol because "it could make them rich, and that it had brought all their great wealth to the order." 123:81 Baronius, Annales Ecclesiastici, tom. xxi, p. 89, where the two bulls are printed, and where the details of the history of the Stedingers will be found. 125:82 Procès des Templiers, edited by M. Michelet, vol. i, pp. 90-92. 125:83 Procès des Templiers, ii, 418. 128:85 See the Procès, ii. 286, 362, 364. 137:92 Du Puy, Hist. des Templ., pp. 22, 24. 138:93 Wilkins, Concil., vol. ii, p. 363. 138:94 Du Puy, Hist. des Templiers, p. 21. 140:95 See our plate XIV. 143:96 Plate XV, fig. 1. 143:97 Plate XV, fig. 2. 143:98 Plate XV, fig. 3. 144:99 Plate XV, fig. 4. 149:100 Du Puy, Hist. des Templiers, p. 94. 151:101 Montfaucon, Antiquité Expliquée, Suppl. tom. ii, plate 59. 151:102 See before, p. 139. 153:103 Wilkins, Concil., ii, 387.